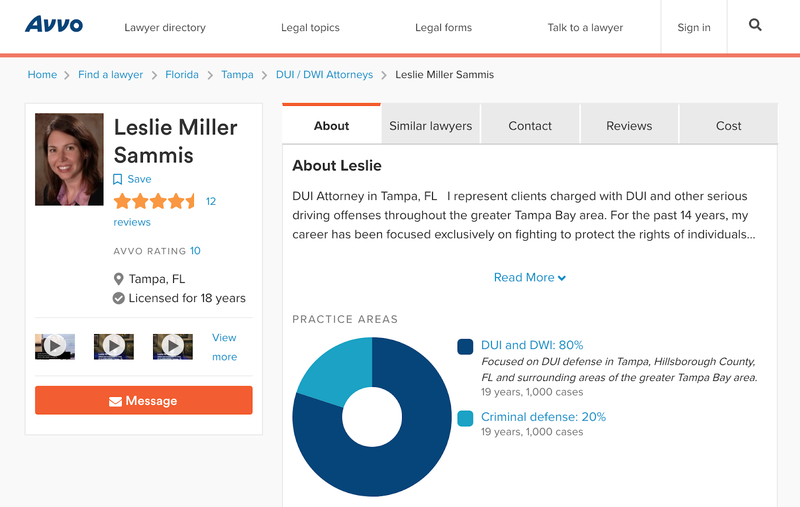 The criminal defense attorneys at the Sammis Law Firm in Tampa, Hillsborough County, FL, created this blog to discuss criminal justice issues, statistics and policy. Leave a comment whether you agree with our analysis or not. Criminal Defense Attorney representing clients throughout the Tampa Bay area including Tampa and Plant City in Hillsborough County, St. Petersburg and Clearwater in Pinellas County, Bartow and Lakeland in Polk County, New Port Richey and Dade City in Pasco County, Florida. This website provides general information only. The information presented in this website should not be construed a creating a lawyer / client relationship or formal legal advice. Deciding which attorney to hire is an important decision that should not be based solely upon advertisements. Before you decide which criminal defense lawyer to hire for your particular case, ask us to send you additional free written information about our education, experience and qualifications. The result of any case discussed on this website are not an indication of any future result in a different case. Your result may be very different because the resolution of each case depends on the particular facts and circumstances of that individual case. There is no substitute for discussing the facts of your particular case directly with an experienced attorney. Contact us today for more information or call to speak with Leslie Sammis. So I had a perfect 10 on Avvo yesterday. In the beginning, Avvo was kind of fun. It was like a game. What is my score? What score do other people have? How do I get my score up? It turns out just about anyone can obtain a 10 rating on Avvo if you just add enough truthful information about yourself. So what is the point? Avvo wants your information and the online traffic it generates. People are googling your name, especially your potential clients who are trying to find the right attorney for their case. Avvo wants to capture that traffic, take it from you, and divert it to other attorneys in your area who are paying for advertising. Good for them, not so good for you. I actually got several clients from Avvo in the beginning with the free listing. When that stopped, I spent several thousand dollars using Avvo's advertising scheme. I track my advertising dollars very carefully. I don't spend very much, but I do track the money I do spend very carefully. The money I spent on Avvo advertising had the lowest return out of all of my advertising dollars, so I stopped doing it. It wasn't necessarily the worse way to spend my money, but it just resulted in a lot of calls I didn't want. Then I forgot about Avvo completely. Earlier this year, I heard that Avvo was acquired by Internet Brands. It happened really quick, but now Avvo is not fun at all. I've made the decision that I don't want to play their game anymore. I especially don't want people seeing that page about me when they search for my name. Avvo will continue diverting people that are looking for me, but I don't have to participate in that. The best way to keep that from happening is to make sure my Avvo profile doesn't show up in the search engines when someone googles my name. Deleting all the information on that page will make it more likely that the page doesn't show up in online searches for my name. Also, if the page has no information on it, then someone looking for me will see the page is blank and click off the page faster. I don't think it is possible for me to delete entire account, but I took down as much as I could. If you know how to delete completely get rid of the profile, let me know in the comments below. What is the downside of deleting all your information from your Avvo profile? Well your perfect 10 rating will drop fast. What happens to my perfect 10 Avvo score today? It took me about two minutes to delete all the information I could. That did cause my AVVO score to drop from 10 to 8.1. I expect it to keep dropping over time. I'm fine with that. We made a big change here at Avvo – As of July 2nd your free Avvo profile will no longer display your phone number, email address, or website on our attorney directory. You have a great profile set up so I wanted to make you aware of the change. I do have a position open to feature you for DUI & DWI and Criminal Defense matters at the top of our directory, with county-wide coverage, and with all of your contact info displayed to potential clients. We only feature up to 4 attorneys at any given time, so it is first come, first serve. With the change I see spots filling up quickly. Did you want me to email you a proposal? For the attorneys advertising on Avvo, I'm sure it works. It makes sense for you to update your profile as often as possible. Be proud of your 10 rating. But since I don't intend to advertise on Avvo, it makes sense to delete everything off my profile except for my name and score which isn't coming down. 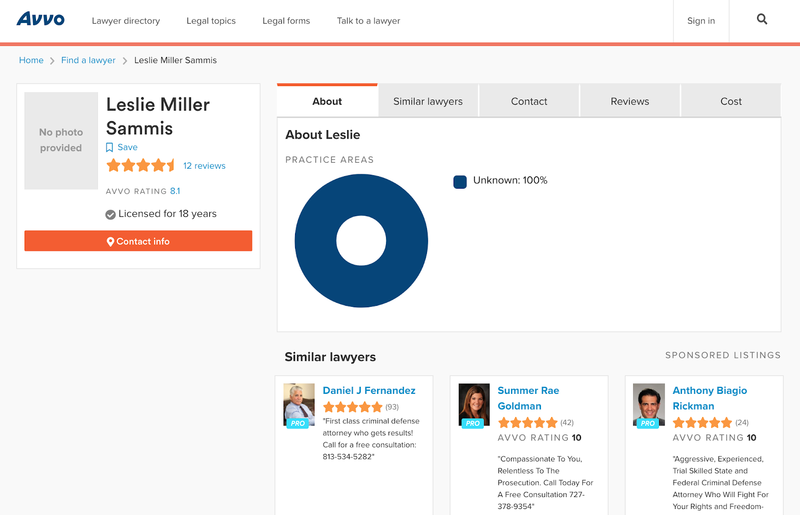 This change is in the process of rolling out to every free attorneys profile in every state. The main reason we are making these changes is to increase user experience with the audience visiting our site. Our data has shown that attorneys who are spending money with us are more timely in response to potential clients who are reaching out for help and representation on legal matters. The second benefit of this change is it’s going to help increase the amount of contacts to our current advertisers. We expect subscribers to see a higher return on investment and in turn this will help Avvo provide a great experience for both consumers and attorneys utilizing our platform. I think they will change course on this because there is no way it would help user experience or their bottom line. But I'm done playing either way.